Did you ever knew that your gadgets contains a small amount of Gold? Yes, it is true that your gadgets contains some amount of gold. With the help of this article you can dig the Gold in your E-Waste. The demand for the new tech gadgets is increasing day by day, not only because it is getting advanced but also because, the devices live a short life. This not only brings in loads of electronic devices to the world, but also loads of electronic waste dumped in the atmosphere. The presence of lead and mercury and other toxic components has made the disposal of the e-waste a great headache. 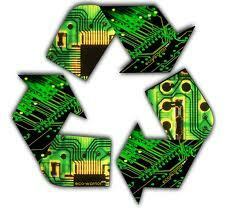 However, the electronic waste also contains precious metals like gold (Au). Gold is in significant amounts that it is much higher compared with the natural ores of Au. So, recycling of the e-waste is becoming more of an important business in the process of Electronic Scrap Material Recycling. Compared with the municipal waste, the electronic waste also has gained a much greater growth ratio. This is because of the fact that the technological gadgets like the mobiles, computers, and such other electronic devices are used at a much higher rate these days. Across the world, it takes 3% of gold, 3% of silver and 15% of palladium to make the mobile phones. Most of the tech gadgets have the gold electroplating on them. Gold electroplating is the process of coating gold using the electrochemical process in the gadgets. Conductivity and protection of wires are the main reasons, of gold plating the gadgets. So, gold can be found in many electronic gadgets especially in the large circuit boards. To separate gold from the devices there are many exclusive methods, and there are many companies that deal with extracting the gold from the gold plated devices. Here are some of the general ways for how to recover gold from the electronic devices. Burning using an extractor isolates gold from the devices and the extraction process is also quite simple. This cannot be done professionally. This is because, the circuits and devices do not only contain gold but also plastics and other materials. When burnt, these materials leave fumes that are toxic. In the US, only at rare occasions this process is used to isolate gold from the gadgets and even amateurs also tend to avoid this because, it involves the risk of harming themselves and the environment. Cyanide solution extracts gold from the devices, and it is a general process. The cyanide clubs with gold and forms gold ions. The ions later can be distilled, and the gold can be obtained. This is a solution to extract gold that cannot be done easily; however, there are issues concerned with this method too. Cyanide is highly toxic, and extractors are required to use with utmost care. There are strict laws to administer use and disposal of cyanide, and they are to be followed to the core in US. This is the mixture of HCL and nitric acid. This mixture is used in large scale because, it can dissolve gold and does not have any adverse side effects to the environment. But, aqua regia too is a toxic mix, and proper ventilation is mandatory to let out the poisonous gas released when the mix is used. This method involves ionization and is the reversal of the process by which gold is fixed to the devices. The gold is attached to the siphon, and this is done by adding a battery. Later the gold is extracted by making it attracted to another metallic object. This method involves the use of microorganisms like Chromobacterium violaceum. This aids in metal recycling. This process does not contaminate the environment and; therefore, considered the most suitable method to extract gold from the gold plated devices.